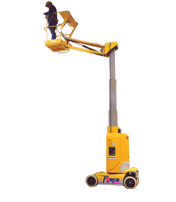 Force’s range of vertical lifts (also known as man lifts) are compact, lightweight machines well suited for all your smaller scale access needs. These lifts are electric and all feature non-marking tyres, they range in working heights from 5m to 10m. Vertical lifts are available in driveable and push around models for more portable and easily manoeuvrable solutions.